Based on the New Jersey Department of Transportation’s (NJDOT) recommendation, the New Jersey Alliance for Action (NJAA) has named Conti's Wittpenn Bridge construction one of New Jersey’s Leading Infrastructure Projects of 2015. The project is part of the NJDOT’s Portway Program, which features a series of 11 independent projects that will improve access to and between the Newark-Elizabeth Air/Seaport Complex, intermodal rail facilities, trucking and warehousing/transfer facilities and the regional surface transportation system. Conti is working for NJDOT to replace the current 1930’s era bridge with one that meets modern design standards for traffic and pedestrian safety as well as higher vertical clearance for navigation, economic development for nearby brownfields and local industries. 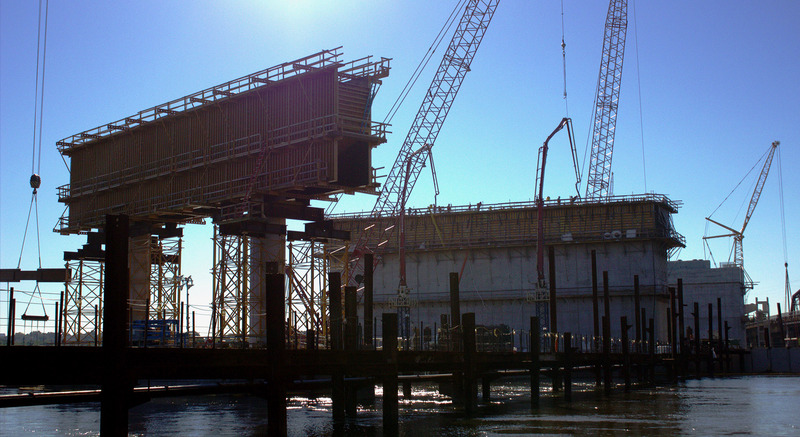 The construction team is performing complex marine bridge substructure work including large drilled shafts, concrete piers and a pier protection system. Conti is self-performing the installation of all these pier components, including the large drilled shafts which support the piers. The NJAA created the award four years ago “to highlight innovative, pioneering and landmark construction initiatives that greatly impact the state’s economy and to honor the businesses and organizations that work together as partners to ensure the project’s success.” Visit NJAA’s website for more information.